This Halloween will always be memorable since the boys were then two years old. 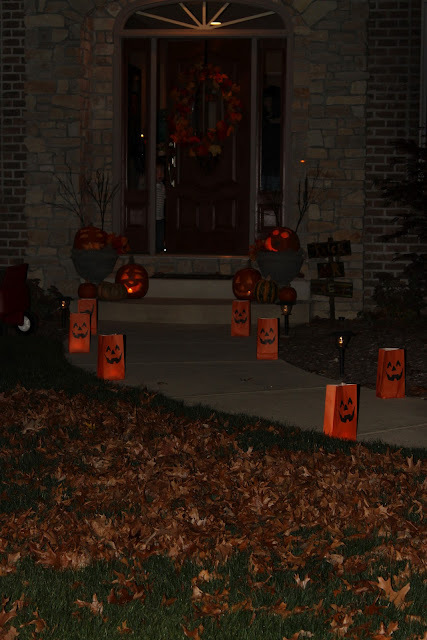 Not old enough to really enjoy the Halloween season, but compared to the previous year they were steady on their feet with lots to say about what was going on around them. We spent the whole month celebrating by attending every kid and adult related Halloween activity in our city! 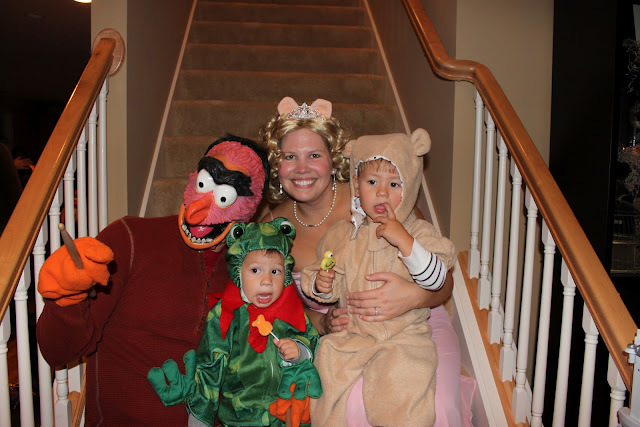 Zoo Boo, haunted houses, my sister and brother in law's party (adults only), trick or treating at the local Humane Society, and the biggest family friendly Halloween party I have hosted to date. Welcome! Cute, not scary for two year olds. Since we had such a great time at last year's Halloween party we decided to do it again, only bigger and better this time. In fact, our house was filled with the laughter and smiles of 17 kids under the age of 5 and 24 adults! More food, drinks, and decorations were also added this year. In previous years, I have sent out Halloween party invites in the mail. However, this year with a busy schedule and so many families I chose to sent out an Evite. While I still prefer the formal paper invites, I have become a fan of Evites' since they are FREE, convenient, and party guests are much more likely to RSVP with a click of a button .And on that note, I know we are all busy, but people please do your party host/hostess a favor and simply RSVP if you were asked to do so. All it takes is the click of a button, a phone call, email, or text and this helps the party host/hostess out a lot with planning for food, space, goodie bags, etc. 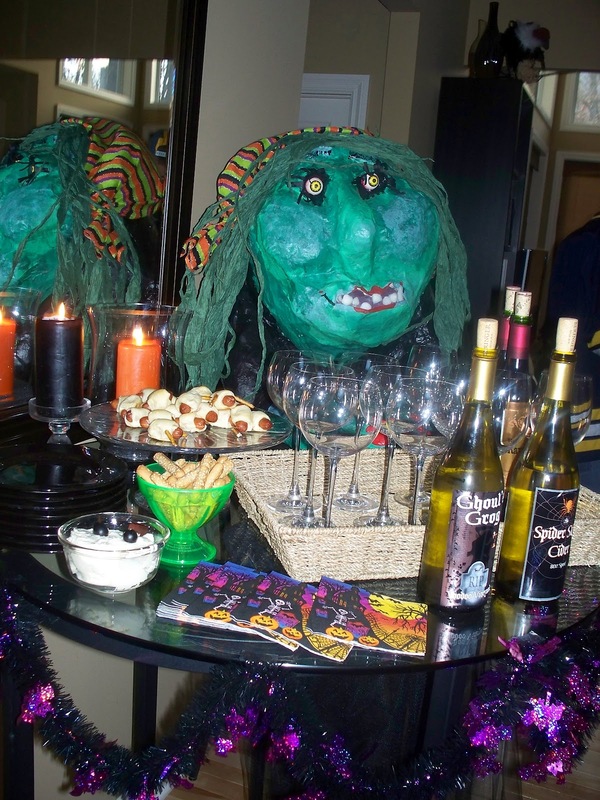 As previously mentioned, I retired last year's witch after I got a look at this witch my mom made for her Halloween party. I found the perfect spot for her in my house. I moved the cocktail table to the foyer so she was the first thing our guests saw when they walked through the front door. We added candles to the table so the light would eerily reflect off the mirror once it was dark and covered the table in appetizers and wine to greet our guests. While the kids were the focus of the party, the adults were there as guests too and I wanted to make it a fun event for all. 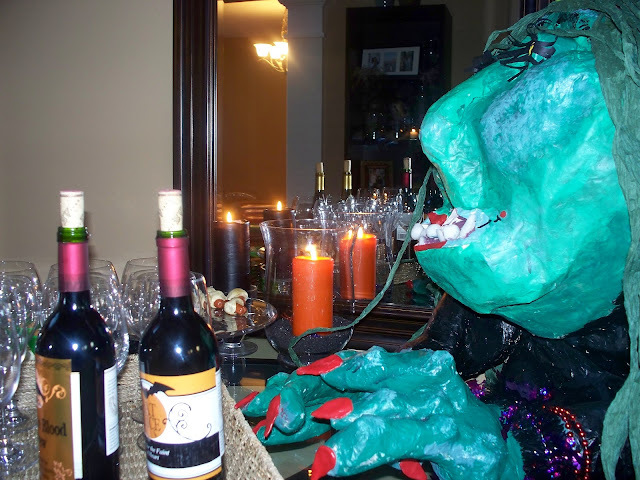 I also covered the wine in Martha Stewart Halloween wine labels available at craft and Halloween party stores. This is the book shelf reflected in the mirror behind the witch. 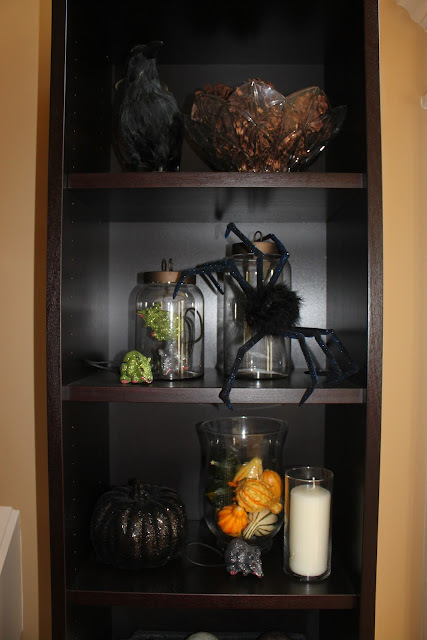 The black crow, spider, glittery rats ($1 a piece), and a variety of gourds filled the shelves. When it was party time, I added creepy Spanish moss, snakes, and tea lights to draw attention to this scary scene which was out of reach of the little ones. On the kitchen table I placed this home made creation. 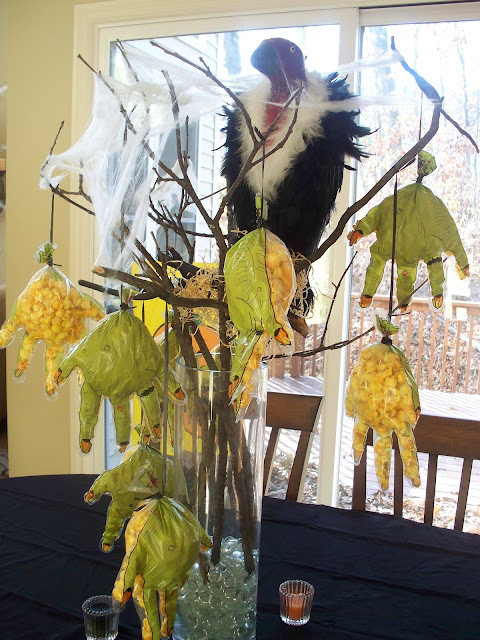 I collected sticks from outside, draped them in spider webs, added the vulture, then stuffed and tied the monster hands from Oriental Trading with cheese popcorn for each family to take home. The kitchen island covered in food, drinks, and dessert. Since the guest list was so extensive, we ordered 8 large pizzas in addition to the home made comfort food and Halloween themed food from last year. 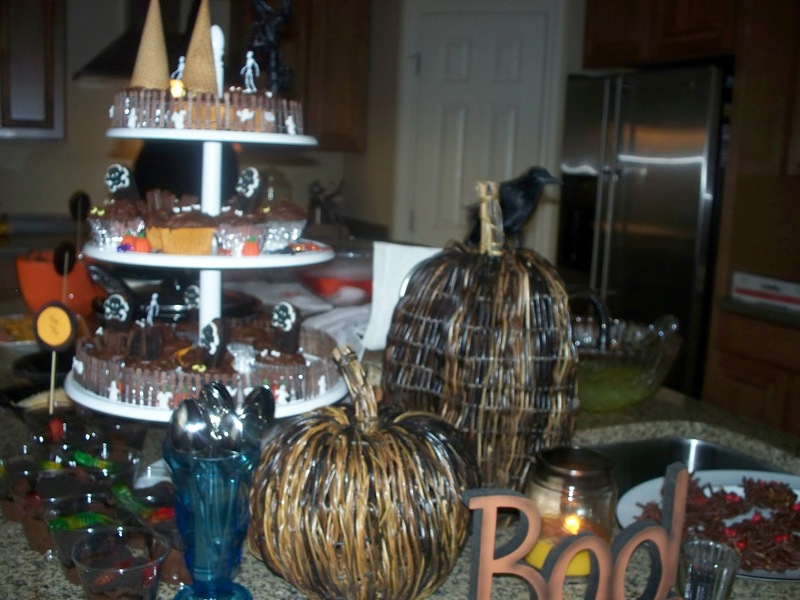 Each dish was labeled with homemade black and orange Halloween pics as seen on the left in above picture. We had devil's eggs, swamp mess (spinach and artichoke dip), witches fingers, and grubs and bugs to name a few. Salad, Martha Stewart macaroni and cheese, kielbasa and sauerkraut, spanikopita and pita (Greek dishes) were also served. Desserts included chocolate spiders with red eyes (on right in above picture), dirt cups, and chocolate cupcakes from the haunted house display. 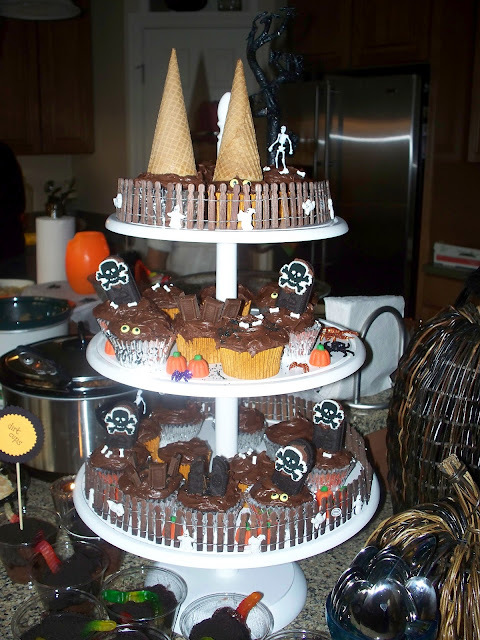 I added miniature skeletons and fencing to the display along with candy eyeballs placed on some of the cupcakes, candy pumpkins, and Oreos with skull and cross bone candy to resemble tombstones. An easy and fun Halloween treat to make is the chocolate spider recipe I found in Ghoulish Goodies by Sharon Bowers. I have made these for my students in the past and they were a huge hit. 1. Line 2 baking sheets with wax or parchment paper. 2. Put the chocolate chips in a microwave-safe bowl, and melt the chocolate in the microwave: Heat on high for 60 seconds, then stir. If it's not smooth, continue to heat in 2 or 3 10 second bursts, stirring well after each burst. You can also melt the chocolate in a pan on the stove, just be careful not to burn! 3. Stir the chow mein noodles into the chocolate and drop the mixture by tablespoons onto the prepared baking sheets. Press 2 red candies onto the edge of each cluster to make eyes and lift a few chow mein noodles up to give a spidery impression. Refrigerate to cool and harden, about 20 minutes, and serve chilled. Store in an air-tight container in the refrigerator for up to 1 week. Drinks included a non alcoholic green punch, juice boxes, beer, and wine. I also added a glass bowl of red food coloring and dry ice for the fog effect in the middle of all the food. Unfortunately this requires a lot maintenance, which I didn't have time for. You need to constantly add water to the bowl in order for the dry ice to continue giving off the spooky, foggy effect. Party time! 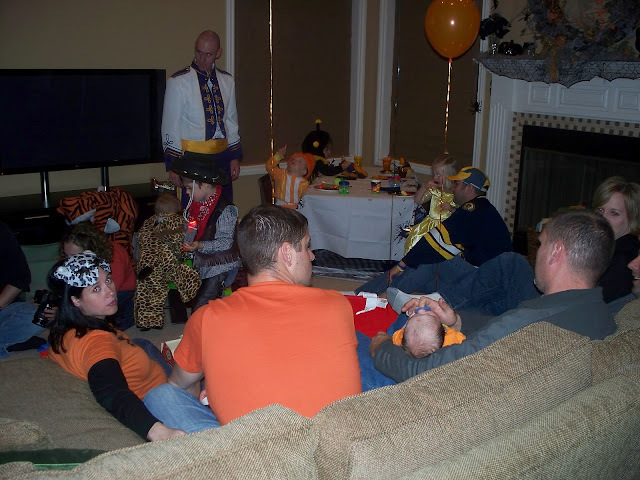 About half of the adults arrived in costume. My goal for next time, is 100%! 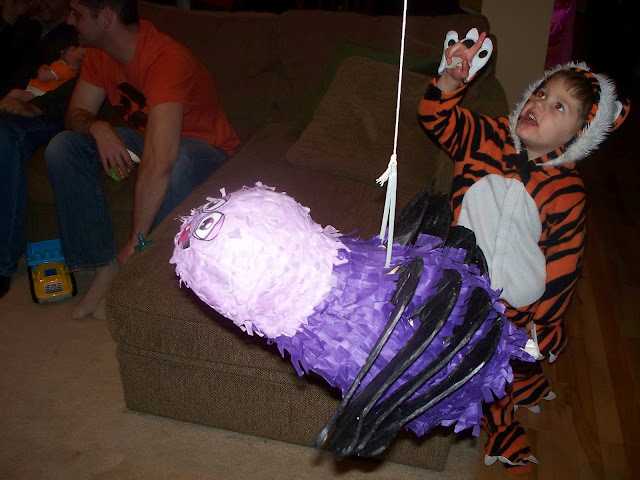 After everyone had eaten it was time for a couple of children's games.The big surprise was the spider pinata I ordered from Oriental Trading. 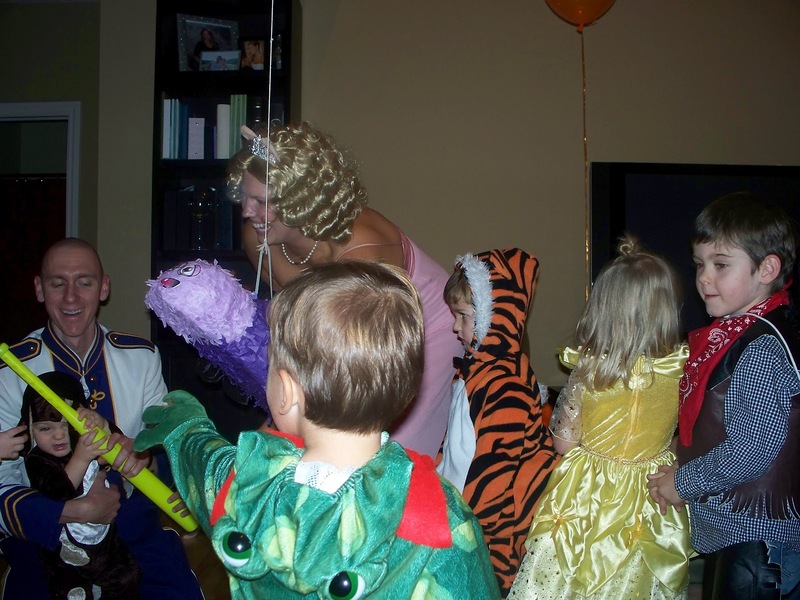 The pinata was stuffed with individual bags of candy and goodies with each child's name so no one would leave empty handed. This also insured that the goodies were age appropriate. We don't want a 1 year old leaving with a choking hazard or a 4 year old leaving with a baby toy. The spider pinata was hung from our balcony above the family room which turned out to be the perfect spot. I was a little worried doing this with so many toddlers, pre-school aged kids, and a plastic baseball bat inside the house. However, all the kids were so well behaved and had a blast! All of them stood back, waited patiently for their turn, and no one was hurt. Success! We let the youngest kids take a swing first. 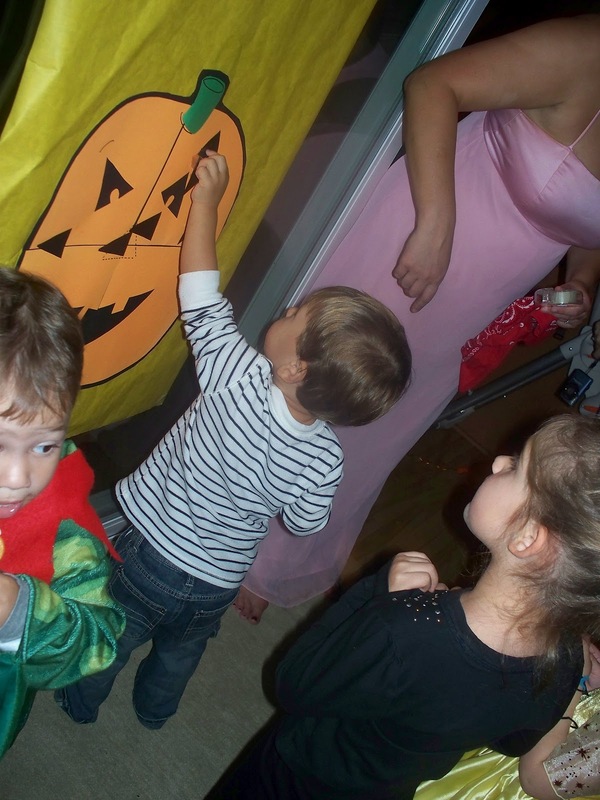 Pin the nose on the pumpkin was back this year to finish the night off! 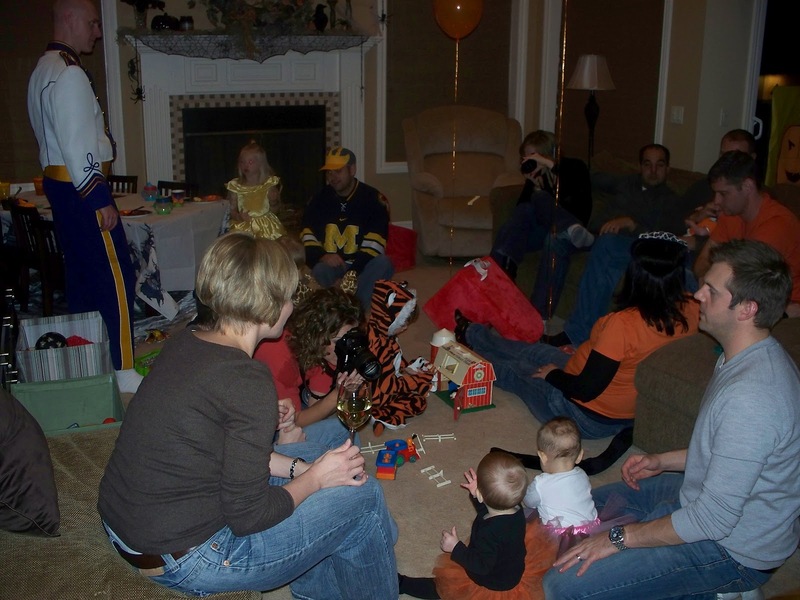 While we did splurge on this party by providing all the food, drinks, and goodies for each child and family, this large of party can also be done in a more budget friendly way by simplifying the food, skipping the alcohol, and stuffing the pinata with a mixture of candy versus individual goodie bags filled with small toys and candy. Asking each family to bring a dish to pass is another option. Although, whatever your preference or budget, if you have a fun group of people, costumes, food, drinks, and games you are almost guaranteed a successful Halloween party! In the end, it was another successful party with lots of happy little goblins and ghouls. 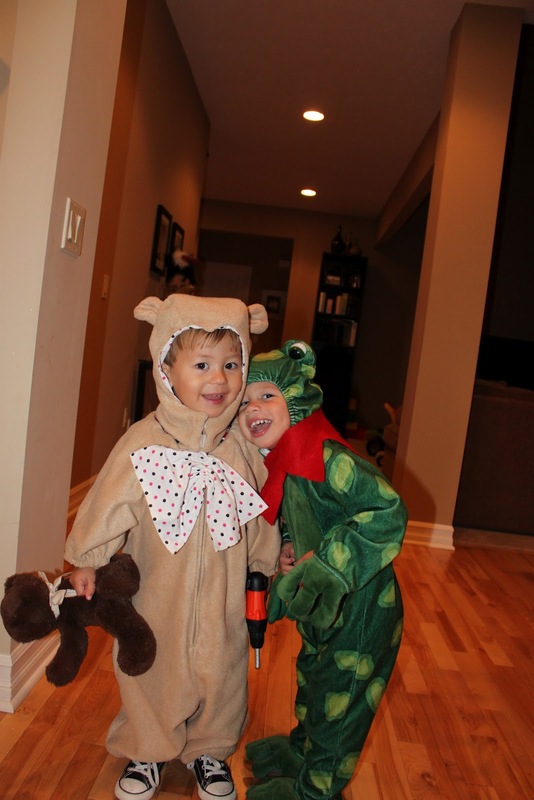 My own little Kermit and Fonzie were all smiles at the end of the night!